The creation of sustainable homes can be achieved to varying degrees, depending on client requirements and choices, availability of materials and technology, location and size of section, and statutory requirements of local councils. With accumulated design experience, specially trained builders and other service providers, and a wide variety of sustainable materials now available we are in a position to routinely achieve a high degree of sustainability. For clients it is often a matter of weighing up higher initial costs (which result in long-term savings) against short term cost savings (which result in higher running costs in the long-term). While the calculation of the financial implications is important to most of us, there are additional benefits derived from a sustainable home that are harder to express in dollar terms: a healthier living environment will have a beneficial effect on the emotional and physical wellbeing of the occupants. And everybody benefits in many ways from looking after the environment, i.e. in terms of climate conditions, energy generation, water and air quality and nature conservation. 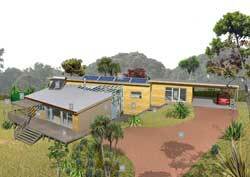 Click here to enlarge the image showing a selection of features of a sustainable home.